Thanks for the questions. Good things to think about as we head into the new year! As a layperson, I really appreciate reading the entries on your site, not only because I learn a lot, but also because the things you write about provide so much insight into the lives and challenges of those who are preachers. I often use the things you share as foundations for how I pray for those who are in a preaching ministry. This was definitely one of those posts which spurred me on to pray for my own pastors and others. Thanks, Peter! 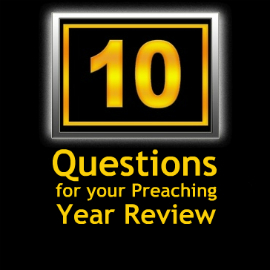 Thanks Gretchen – I suspect a lot of pastors would love to have their congregations read your comment!